What it’s supposed to be: A B-Movie about a comet that passes earth and leaves behind red dust that kills almost everyone and turns many of the remaining people into killer zombie types, resulting in a desperate fight for life in a lonely, empty world. Why it’s a Christmas movie: From the opening narration: “Since before recorded time, it had swung through the universe in an elliptical orbit so large that its very existence remained a secret of time and space; but now in the last few years of the 20th century, the visitor was returning. The citizens of earth would get an extra Christmas present this year as their planet orbited through the tail of the comet…” And indeed, before the Christmas festivities start, people are revelling in the coming of the comet instead, although they have put up decorations and clearly have been getting ready for the holidays. Thoughts: The holiday celebrating the birth of Christ and the extinction level event that took out the dinosaurs are both mentioned at the beginning, showing that this movie is trying to be About Something. Or maybe pretending to be About Something. Or maybe a little bit of both. Everyone in front of and behind the camera knows what this movie is trying to be. Tongue firmly in cheek, the horrors of survival, alone, in a dead world with zombie type people thirsty for your blood are explored via explosions of violence, ending on a melancholy but hopeful note. It’s not the greatest movie ever. It’s not the greatest movie on this list. It’s possibly the greatest teenagers on a dead earth movie on this list. It doesn’t rise above the genre much, but it’s not as poor as B-movies, especially in the 80s, could be. Is It Naughty or Nice? Either you like B-movie sci-fi horror or you don’t. If you do, this is for you. if you don’t, you may still appreciate this movie. 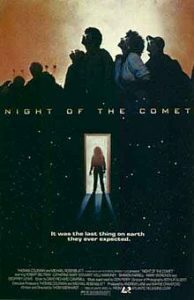 One Response to "NIGHT OF THE COMET — Strange Christmas Movies Round 2 (#47 of 48)"